Today's New York Times features a rundown of the pros and cons of the four cities that are finalists to host the 2012 Democratic National Convention. The Times leads off with Charlotte (referencing Mayor Anthony Foxx) in the article, "Cities Compete for 2012 Democratic Convention," and it links to mini-profiles of each of the cities, which also include Cleveland, Minneapolis, and St. Louis. Having grown up in a small town in South Carolina, where nothing major ever really happened, I tend to be a fan of big, shiny events coming to the city in which I live. If it was up to me, Charlotte would host the Super Bowl, NBA All-Star Game, Summer Olympics, Comic-Con, NAI Auto Show, and a few others all in one year. Okay, that's absurd. But what's not absurd is Charlotte's chances at hosting the coveted DNC, which would pump tens of millions of dollars into the local economy and literally place the city on the world's stage. After reading The New York Times' breakdown and their "Pick It" and "Skip It" criteria, I would say that if Charlotte doesn't win the bid, the next likeliest choice is St. Louis. But if it came down to CLT and STL (as it has been rumored to be), we should remind Obama and 'em that St. Louis was recently ranked as the most dangerous city in America. I'm surprised the Times didn't mention that in the "Skip It" category. As the newspaper points out, Democrats were expected to make an announcement this month regarding the host city. Who knows if it will happen by then, which could be a heckuva Christmas present for the Queen City. If you didn't know, months ago Charlotte boosters created a website to publicize their efforts to attract the DNC. 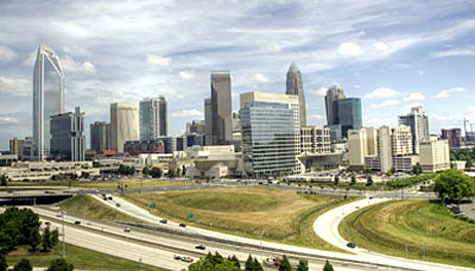 You can find it at CharlotteIn2012.com, which includes links to their social media sites.